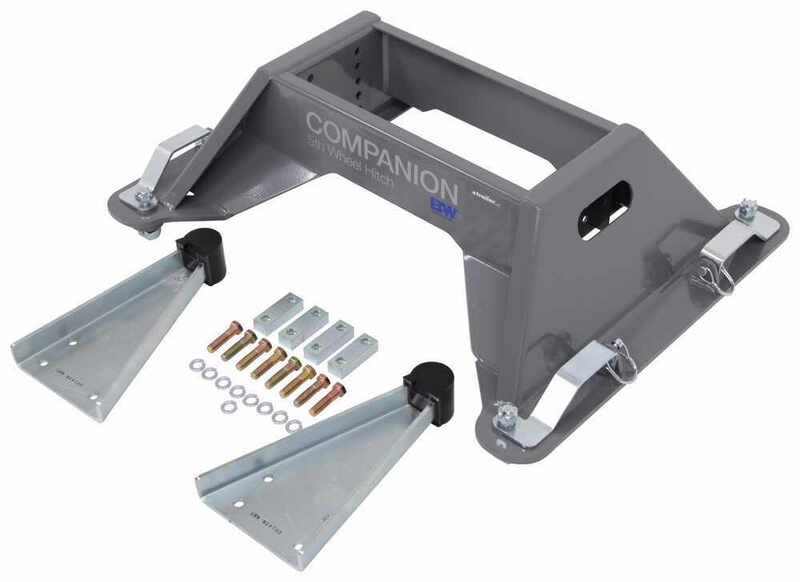 This replacement base fits your B&W Companion fifth-wheel trailer hitch for the Chevy/GMC factory 5th-wheel towing prep package. Unit sits in the sockets in your truck bed for easy installation and removal. Call 800-298-8924 to order B and W accessories and parts part number BWRVB3700 or order online at etrailer.com. Free expert support on all B and W products. 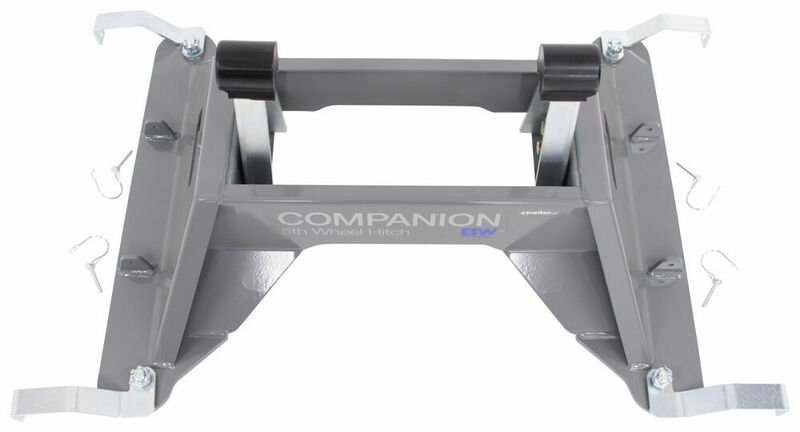 Guaranteed Lowest Price and Fastest Shipping for Replacement Base for B&W Companion OEM 5th Wheel Trailer Hitch for Chevy/GMC. Accessories and Parts reviews from real customers. 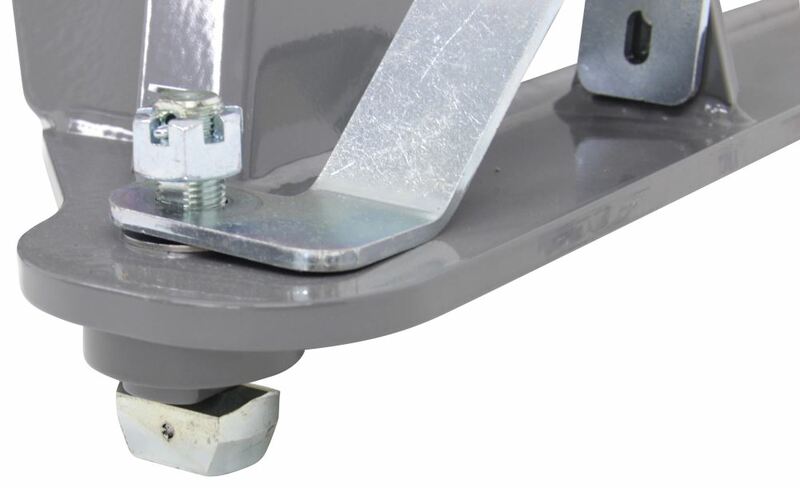 This replacement base fits your B&W Companion fifth-wheel trailer hitch for the Chevy/GMC factory 5th-wheel towing prep package. Unit sits in the sockets in your truck bed for easy installation and removal. Height setting: 16-3/4" - 18-3/4"
Extended Latch Pin Handle for B&W Turnoverball Gooseneck Trailer Hitch - 17"
Curt Pop-In Ball for Factory Chevy/GM, Ford, and Nissan Underbed Gooseneck Hitches - 2-5/16"
Today we're going to take a look at the replacement base for the BMW companion OEM fifth wheel trailer hitch for Chevy GMC trucks. Now this replacement base will fit the BMW companion OEM fifth wheel trailer hitch, part number BWRVK3700 that we do sell separately on our website. This base does come with the adjustable pivot arms here that I've installed just to show you where they go. This will let you mount your hitch head, which is sold separately, to fit your application. These pivot arms can install in 2 different horizontal positions for improved cab clearance. When you install them, that also gives you an option to raise or lower the hitch head with 3 different vertical height settings. That's critical on the height settings because you do want to, when you tow your fifth wheel, you do want to make sure it's level with your tow vehicle. If you notice on the top, it has the polyurethane bushings on these pivot arms. This is where the hitch head will sit onto, gives you a nice quiet, rattle free ride. Now the space is is a very quick, simple installation. Basically it drops into the 4 receiver pucks that are built into your factory underbed rails, on your Chevy or GMC truck. 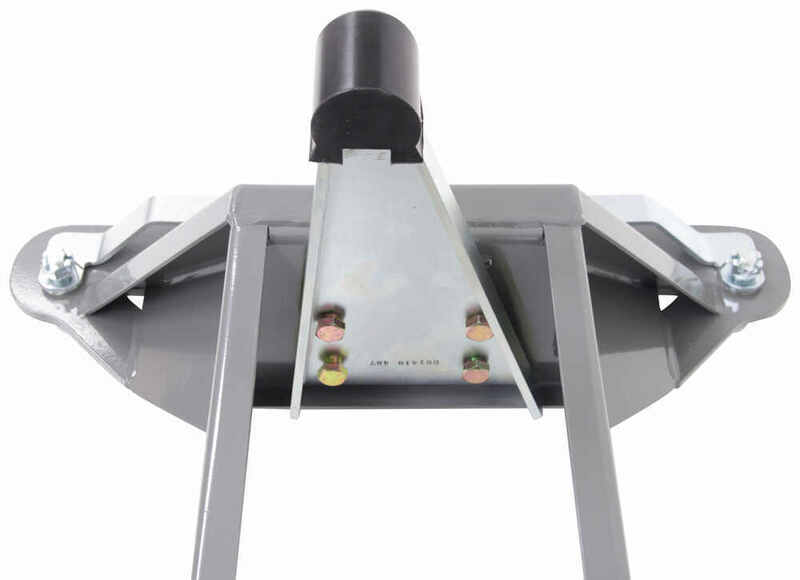 It is a quad return quick lock puck system that will allow easy mounting and removal of the hitch. Basically when you go to install this into your vehicle, all you have to do is pull the penning clip, rotate the handle, a quarter of a turn - you'll do that on each corner - and that rotates the tab, allows you to drop it into those pucks that are in the underbed system. Once they drop into place, rotate it back a quarter of a turn, which rotates the tabs to lock it into position. Put the pin through the base and the handle, and it will lock it. You do that at each corner. Very simple installation. Now because of that design, it is a rail free design, which means there are no rails in the bed of the truck. When you do remove this hitch from your truck bed it will allow full access of your truck bed. The finish on this, it's a grey, powder coated steel, which is corrosion resistant. This part is made in the USA. 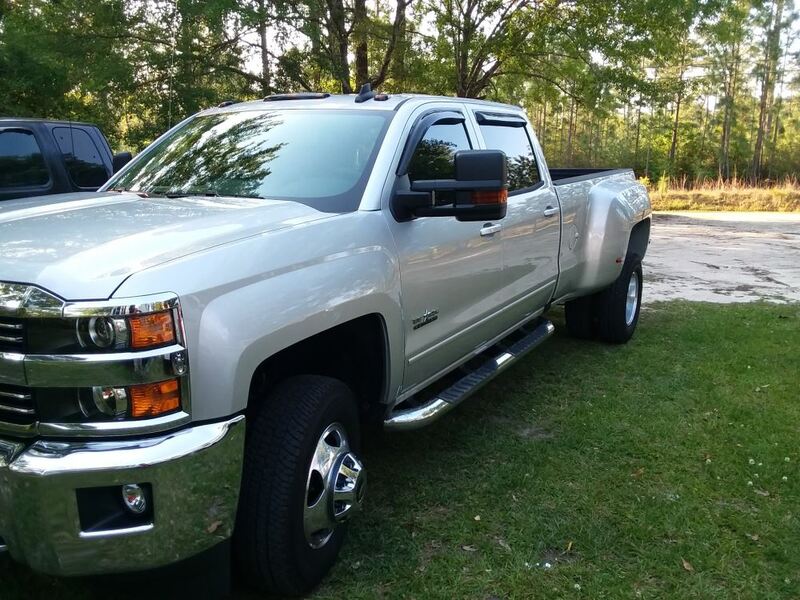 Again, the application on this is 2015 and newer Chevy GMC trucks that have the factory installed towing package. Gross towing weight capacity is 20,000 pounds. Tongue weight capacity is 5,000 pounds. The vertical height settings, we mentioned 3 different settings, would be at either 16 3/4", 17 2/4 " and 18 3/4". That measurement is once the hitch head is on here. The measurement would be from the truck bed to the top of the hitch head. That should do it for the review on the replacement base for the BMW companion OEM fifth wheel trailer hitch for Chevy and GMC trucks. 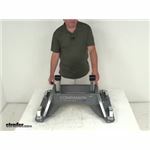 Order: RelevanceNewestRating - High to LowRating - Low to High This replacement base fits your B&W Companion fifth-wheel trailer hitch for the Chevy/GMC factory 5th-wheel towing prep package. Unit sits in the sockets in your truck bed for easy installation and removal. 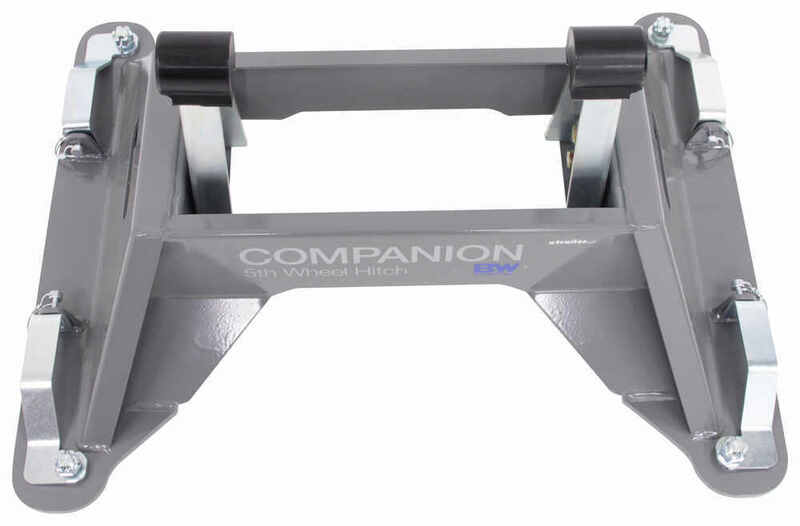 Yes, you will be able to use your current B&W Companion head with the Replacement Base for B&W Companion OEM 5th Wheel Trailer Hitch for Chevy/GMC, # BWRVB3700. I confirmed with my contact at B&W that the Companion heads are interchangeable between the bases. 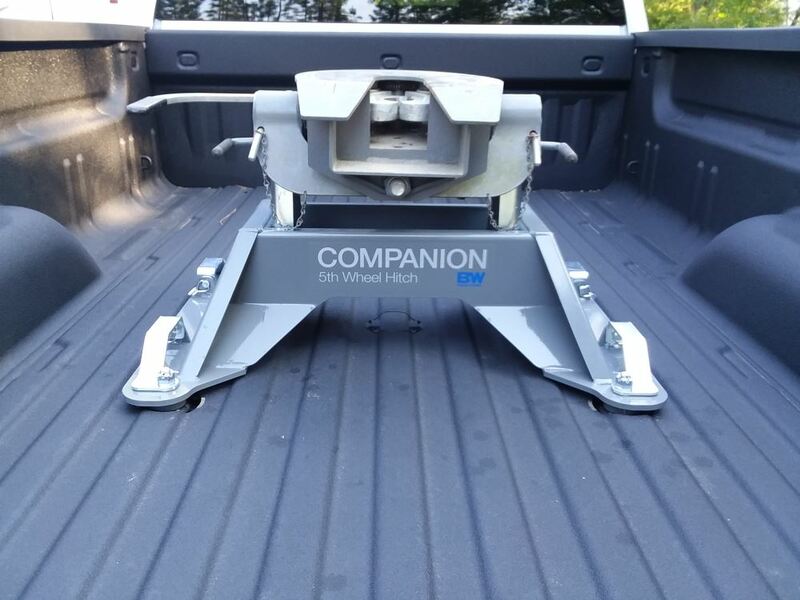 Using the # BWRVB3700 base on your 2017 Chevrolet Silverado 3500 will give you a gross towing weight of 20,000 lbs. I called my contact at B&W and asked about your Patriot fifth wheel hitch head. They told me the Patriot head will not work with the companion legs that fit the puck system on your 2016 Silverado. 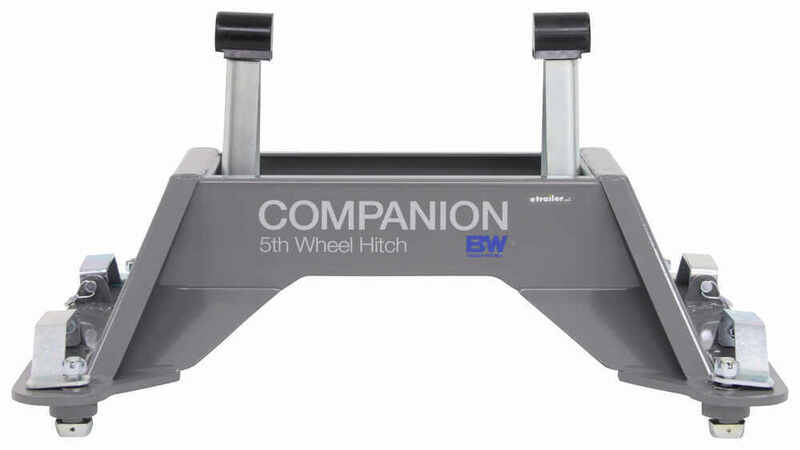 If you decide you want to change out your fifth wheel hitch, we do offer the Companion, part # BWRVK3700 that will work with your pucks. We also carry the Curt Q25 5th Wheel Trailer Hitch, part # C16069, that is also designed to work with the puck system in your truck. If you are asking about a 2017 GMC truck with a factory gooseneck, the Companion will not work for you. The factory gooseneck on GM trucks is made by Curt. 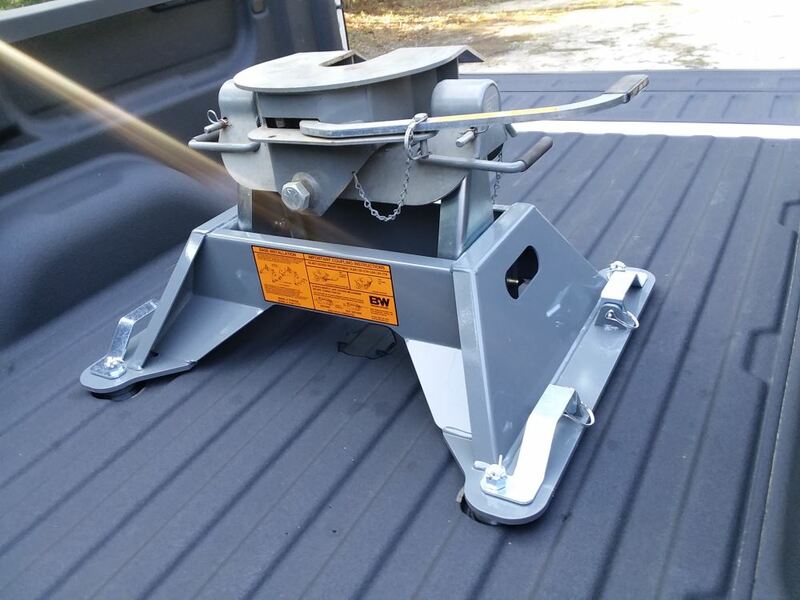 If the 2017 GMC truck has the factory 4-puck system in the bed then you can buy a replacement base that will allow you to install a companion fifth wheel hitch head on the base and use it in the pucks. For the replacement base you would need part # BWRVB3700. 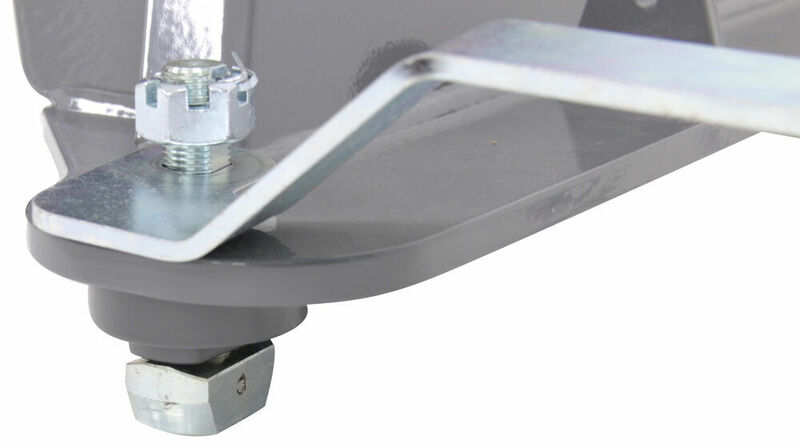 Yes, you will be able to take the head off of your current B&W Companion 5th Wheel Hitch and use the B&W Replacement Base for the OEM 5th Wheel Trailer Hitch for Chevy/GMC, # BWRVB3700. The B&W base will fit in the factory rail kit of your 2018 Chevrolet Silverado 2500 truck. The base has a gross towing weight rating of 20,000 lbs and an adjustable height setting between 16-3/4 to 18-3/4 inches. 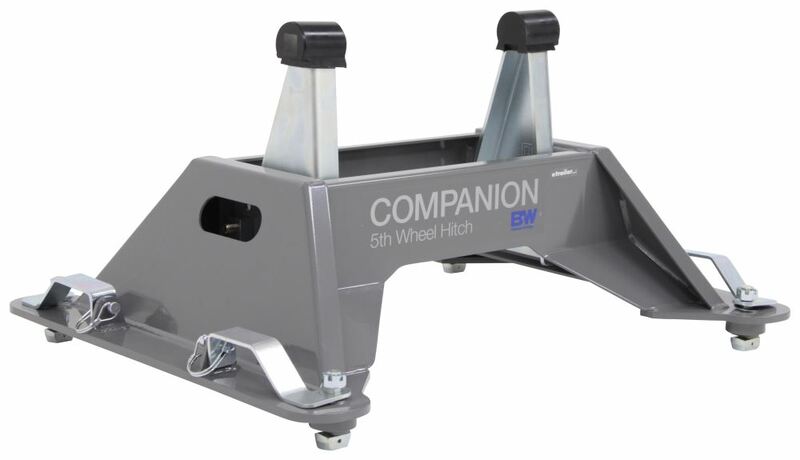 Yes, the B&W Companion 18K 5th Wheel Hitch Head will fit the Replacement Slider Base for B&W OEM 5th Wheel Hitch part # BWRVB3770 on your 2019 Chevrolet Silverado 3500. The sliding base part # BWRVB3770 is 36" long x 32-3/8" wide and the fixed base part # BWRVB3700 is 16-3/4" long x 18-3/4" wide. 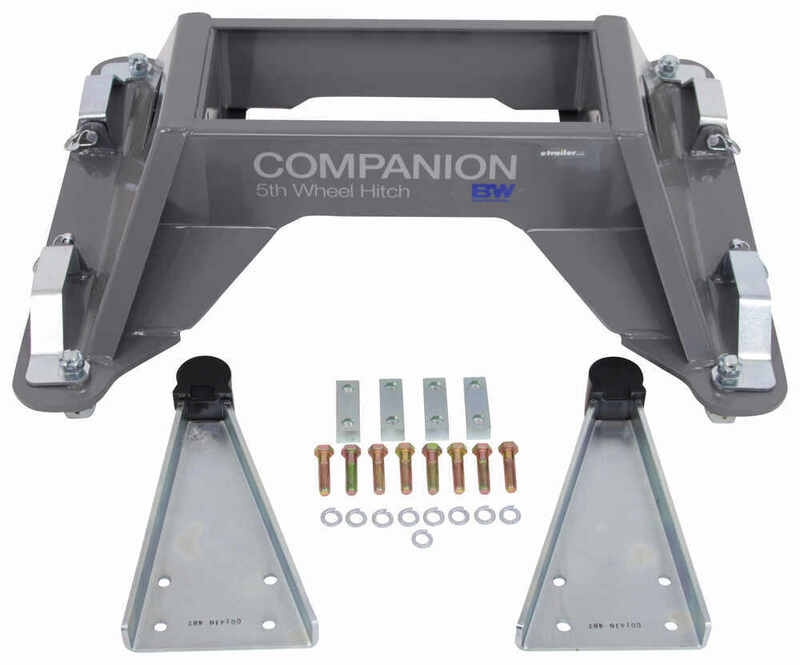 Yes, you can take the head of your current B and W Companion hitch and install it on the leg kit part # BWRVB3700 and you'd then basically have the part # BWRVK3700 which is the correct hitch for the rail kit of your 2017 Chevy Silverado. 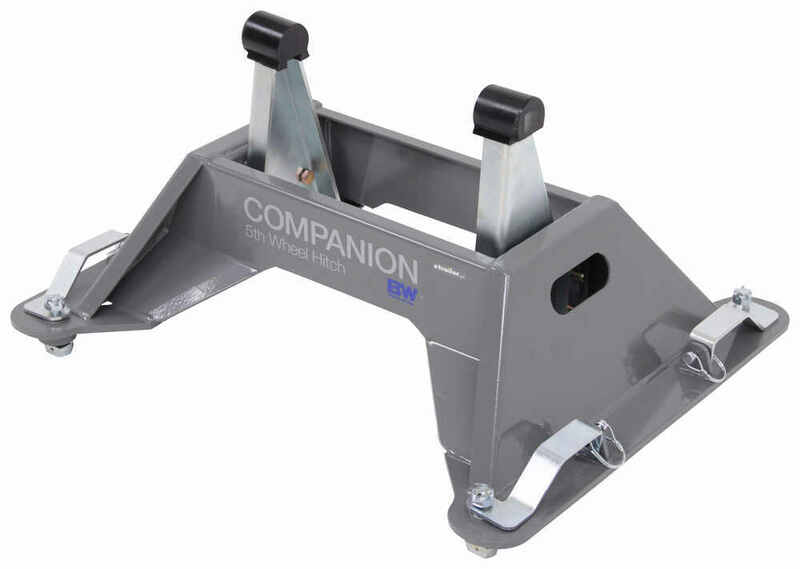 Will Replacement Base fit B&W Companion RVK3000 Fifth Wheel Hitch? I spoke with a representative of B&W who confirmed for me that the B&W Companion model RVK3000 will fit into the Replacement Base for B&W Companion # BWRVB3700 that you referenced. I've added a link to a video review of this product for you to take a look at as well. I do have an option for you but they do not make an adapters that will allow you to use the B&W Companion Gooseneck-to-5th-Wheel Trailer Hitch Adapter part # BWRVK3500 with the factory prep package on your 2019 Chevrolet Silverado 2500/3500. 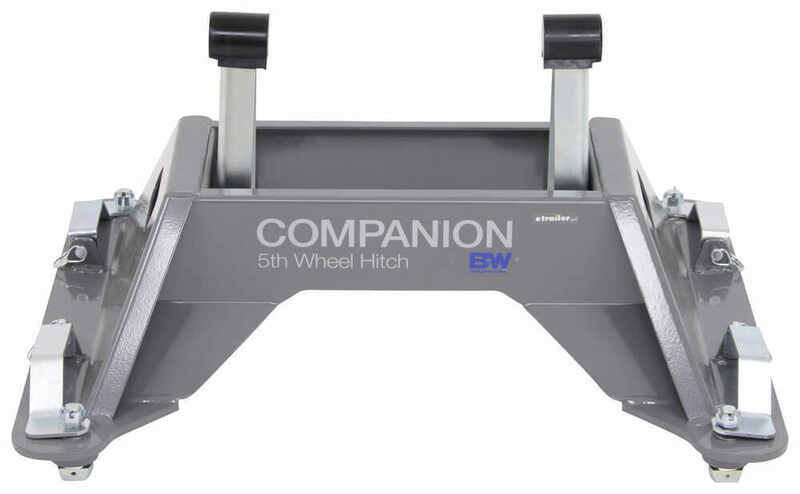 However, the head of your current B&W Companion Gooseneck-to-5th-Wheel Trailer Hitch Adapter can be reused with the Base for B&W Companion OEM 5th Wheel Trailer Hitch for Chevy/GMC part # BWRVB3700 to cut down on cost. Notes: Item has slight install/test fit marks, otherwise new and unused. Notes: This item is missing the hardware. It is in great condition and has never been used.